Hand of Jessee Horror: Tiny Mummies - Part Two! 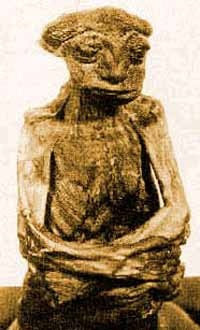 As a follow-up to my original post on Aleshenka located here, I bring you today the stories of two more small alienesque mummified creatures: Pedro the Mummy and the Atacama skeleton. Located in the Rocky Mountains, the Nimerigar are a race of little people characterized as aggressive, who liked to shoot poisoned arrows from tiny bows. 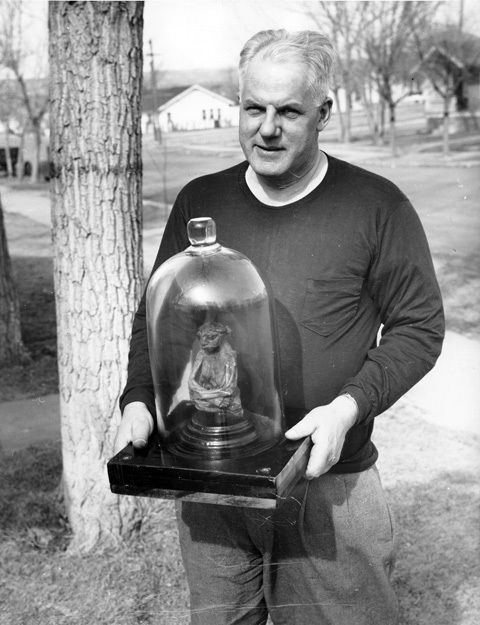 In October of 1932, while digging for gold in the San Pedro mountains of Wyoming, Cecil Mayne and Frank Carr came across a small room in which they found the mummy of a tiny person. There was instant skepticism surrounding the mummy but x-rays were performed 18 years later in 1950 and it was discovered that there was a fully formed man-like skeleton inside. Pedro was 14 inches tall, sitting with crossed arms and legs. 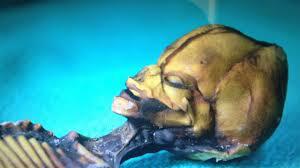 His cranium was flat and his eyes bulged and you could even see little fingernails on his fingers. The x-rays on Pedro provided further enlightenment - several of his bones were broken including his spine, collarbone, and skull. He also had some congealed blood at the top of his skull, insinuating a violent death. 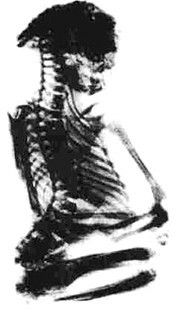 Pedro was examined by Dr. Henry Shapiro, a biological anthropologist from the American Museum of Natural History, where it was determined that the man was approximately 65 years old at the time of his death. Plot twist: There was a second mummy found, a female, in roughly the same area where Pedro was discovered. This mummy was brought to Dr. George Gill for examination. She was only four inches high and it was determined that she was a prematurely born baby or a child with anencephaly. Dr. Gill also believed Pedro was an infant rather than an adult and that both mummies were a result of malnutrition of babies born to a tribe still adapting to the harsh conditions of the area. To give some more background on the Nimerigar, they lived in the San Pedro Mountains and fought constantly with the average sized humans in the area. Apparently, when one of their own became sick or old, they were killed by their own people with a blow to the head. The Nimerigar were believed to be bad luck to anyone who found them and are referred to as "tiny people eaters." Many considered this all folklore and urban legend until Pedro was discovered. Sadly, Pedro the Mummy's story ends in his disappearance. He was purchased by Ivan T. Goodman for several thousand dollars after being shown as an attraction in a local drug store for several years. Goodman died in 1950 and Pedro was passed on to Leonard Wadler. Wadler died in the 1980s and Pedro has not been seen since. Ata was discvoered in 2003 in a deserted Chilean town in the Atacama Desert by Oscar Munoz near an abandoned church. Munoz sold Ata to a local pub owner for the equivalent of $51.00 USD who later sold Ata to his/her current owner, Ramon Navia-Osorio. 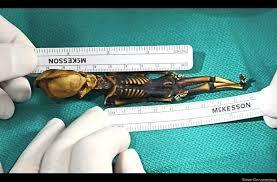 Ata is only six inches long, with an irregularly shaped skull and two missing ribs. It is also believed that Ata is a prematurely born fetus suffering from oxycephaly or a combination of genetic disorders. Immunologist Garry Nolan speculated that Ata suffered from dwarfism but no genes for dwarfism were found during genetic analysis. Of course, conspiracy theorists/ufologists have labeled Ata an alien but this speciulation is inconsistent with the human genetic material gathered during evaluation. The film Sirius is a 2013 documentary directed by Amardeep Kaleka based upon the book Hidden Truth, Forbidden Knowledge by Steven M. Greer. Sirius features interviews from former government officials as well as images and a DNA analysis of Ata. I guess my overall feeling about Aleshenka, Pedro, Ata, and likely the many other little mummy aliens out there is creeped out but also quite fascinated. More than anything, stories like these lead me to realize how easy it is to stumble across a little creature like this, near a church, in a cemetary, while gold digging in the mountains (okay, so that one's not quite as plausible.) What would I do if I stumbled across one of these creatures? Scream and run away? Put it in a box and poke holes in the top? Nudge it with a stick? (Does this seem insensitive?) I mean, what would you do? Regardless, I can't say what my response would be if I ran across my own version of Aleshenka/Pedro/Ata, but best believe if I did find one, I wouldn't sell it to a pub owner for $51.00.